Rockstar have just posted up a new Asked & Answered article in which they answer some pressing fan questions to do with some very hot topics right now. There's also one new screenshot that's been released teasing a forthcoming GTA Online update. Below that is a short summary of each of the big questions and Rockstar's answer to each. One thing of note is the absence of anything about the single player DLC that was announced last year, this is likely to have been pushed back a bit because of the recent PC release. Rockstar say Heists are not the kind of things they can just go ahead and keep adding to the game, they're a "huge undertaking". However, there are some new updates coming to Online which will include some "very cool new toys" to spend your cash on - see the new screenshot above for a glimpse of what's to come. On a related note, it was also asked if the last gen consoles (PS3 / 360) would be seeing future updates. Rockstar acknowledge that at some point they'll hit a technical limit and simply won't be able to add any more, but they're doing their best to optimise the game in every way they can, and are currently working on the next big update. A lot of people have been asking for Rockstar Editor to come to consoles. 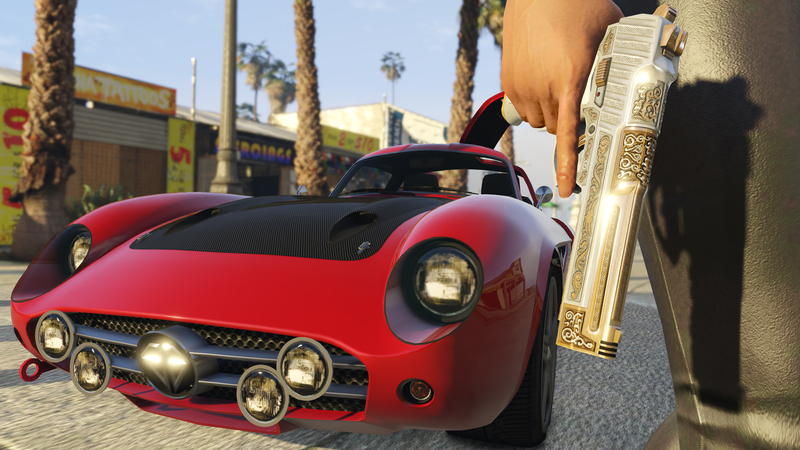 It's a powerful tool best suited to PCs, but Rockstar say they are working on a version specially tailored to the less powerful PS4 and Xbox One versions of GTAV, hoping to release it in the summer (read: whenever it's actually ready). Another PC exclusive feature was new radio station The Lab, fans have been asking if that will be coming to consoles too. Yes, it will. Rockstar plan to add it to all four consoles, including the last gen ones, in a forthcoming update. The PC version of GTAV allows players to curate their own radio station from MP3 files on their computer. Console players want this functionality too, but unfortunately, according to Rockstar, it is not technically possible on consoles at the moment as it requires more than they allow. Will I get banned for modding GTAV PC? Nope. Not in single player. But if you use mods in GTA Online that might give you an advantage over others then yeah, you're probably gonna get banned. We have always appreciated the creative efforts of the PC modding community and we still fondly remember the awesome zombie invasion mod and original GTA map mod for GTAIV PC among many other classics. To be clear, the modding policy in our license has not changed and is the same as for GTAIV.� Recent updates to GTAV PC had an unintended effect of making unplayable certain single player modifications. This was not intentional, no one has been banned for using single player modifications, and you should not worry about being banned or being relegated to the cheater pool just for using single player PC mods. Our primary focus is on protecting GTA Online against modifications that could give players an unfair advantage, disrupt gameplay, or cause griefing. It also bears mentioning that because game mods are by definition unauthorized, they may be broken by technical updates, cause instability, or affect your game in other unforeseen ways. Joystick / Steering wheel support for GTAV PC? They make no promises, but Rockstar say they are currently investigating what additional support they might be able to add. Nope. But you can of course install Windows 7 / 8.1 through Boot Camp and play it that way. An article on R* Support has been added with instructions for those who don't know how to do this. Rockstar obviously say they don't support or condone people doing this to get an unfair advantage, and have updated their copyright policy to reflect this, and these sorts of videos will be getting flagged for takedown now. Rockstar continue to thank players for reporting bugs, glitches, cheaters etc. via the support site. Rockstar are doing all they can and are regularly rolling out hot fixes and patches for things like this, they believe they are making significant progress towards combatting most of it. And that about sums it all up. If you want to read all the questions and answers in full, head over to the Newswire article. I priced eBay and local store Microcenter cards for PC, the most expensive is nVidia's top Non Titan card (which MC doesn't carry) the 980GTX with 4GB of GDDR5 Ram, the other option for far less is a card using 4GB of DDR3 Ram, that maybe GDDR3, but it doesn't help with info on the retail boxes. Some if not most cards only have 1GB of GDDR5 and a 128 bit memory bus. I wish we could move past that bottleneck, somehow there's some engineers who don't see it being a continued set back....!?!?!? Anyway, prices for cards I'd consider up to that major hot nVidia 980 are to 0 at present. Typically a GTX Titan sells for 00, unless you can find it cheaper! A report in the press I also looked at says that nVidia is proudly showing off yet another GPU core successor, what that means is even the best of the best will be yesterday's news eventually! We're waiting for Skylake and new Core i7 Intel CPUs, but this article suggests within a year, new nVidia GPUs as well! !